The Book of Mormon has the power to help anyone who wants to know it’s true. What amazes me about the Book of Mormon is the great and eternal change it causes in people even before they are members of the Church. As a missionary in the Mexico Cuernavaca Mission, I saw this great change firsthand. When I had been on my mission for six months, a member of the branch referred my companion and me to teach a 20-year-old woman and her family. The young woman didn’t understand what Latter-day Saints believed and asked us many questions. Knowing that the Book of Mormon answers questions of the soul, we gave her the book and shared the promise it contains about praying sincerely to know if it is true. For three weeks she attended church, and we continued meeting with her. 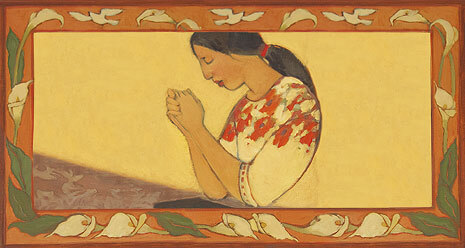 We didn’t know that she had already taken an important step: she had prayed about the Book of Mormon. During one particular lesson, she told us of her experience. She had been thinking a lot about the lessons we were sharing, and she desired to pray on her own. She knelt down and asked God if the Book of Mormon was true. The peace she felt after praying encouraged her to read more of the book. While reading, she felt the Spirit sweep over her. I felt so much joy in my heart when she recounted her experience. I knew I was on sacred ground on that occasion. The Holy Ghost confirmed to me that her words were true. From her testimony I was reminded of the great love our Heavenly Father has for us; He loves us so much He has given us the Book of Mormon as an instrument to know Him and His truth. When we obey the principles found in the Book of Mormon, our lives will change. The Book of Mormon has the power to help us find happiness and peace. When we read it, we will develop a firm determination to live the gospel of Jesus Christ, just as this sister determined to follow the example of the Savior into the waters of baptism.